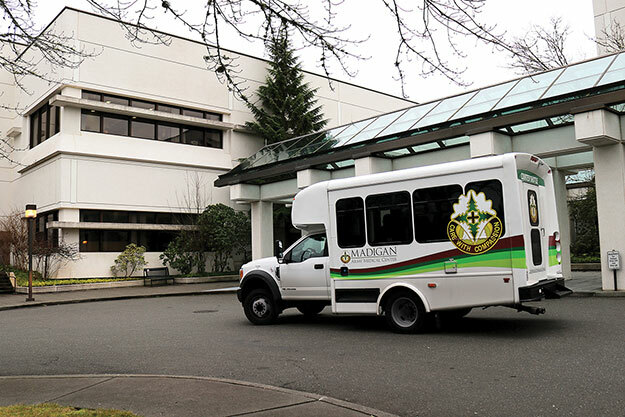 To ensure the safe movement of patients, visitors and staff at Madigan Army Medical Center, the facility operates the Madigan Courtesy Shuttle. The two vans, which have a capacity of eight seated passengers and two secured wheelchairs each, service the campus and Madigan's buildings in the immediate area. The vans circulate the main parking lots and provide transportation to and from the Brig. Gen. Turner Preventive Medicine building (9025); Joint Base Lewis-McChord Center for Autism Resources, Education and Services (JBLM CARES at 6993 Jackson Ave.); and the Madigan Annex. The vans maintain service hours to all areas from 8 a.m. to 3:30 p.m., Monday-Friday. They provide limited service in the main lot before and slightly after these hours as well. Patients can call the drivers directly for rides to and from their vehicles in Madigan's parking lots during the hours listed above. Shuttle #1, driven by Gordy, is at 253.495.7110, and shuttle #2, driven by Dwight, is at 253.691.9781. "The service started small, with our security team and a golf cart," explained Jeremy O'Bryan, the Madigan chief of Patient Experience. "Now we have two fully branded people movers and two of the kindest gentlemen you'll meet to operate them." The courtesy shuttle grew from sheer demand. The two vans drive more than 100 riders per day; that's over 2,000 a month. "Whether people are coming in for appointments or other services, many need assistance," said O'Bryan. "The shuttle contributes to safer care and improved access -- ensuring patients don't exacerbate an injury or illness while walking through our parking areas." All of these options are free and available to staff, patients and visitors.